Clinton to suspend campaign, bucking for VP bid? WASHINGTON (CNN) -- Sen. Hillary Clinton on Saturday will officially suspend her campaign for the presidency and "express her support for Senator Obama and party unity," her campaign said Wednesday. Sen. Hillary Clinton said Tuesday that she will let her supporters and party leaders decide her course. The Clinton campaign said she will make the announcement at "an event in Washington, D.C.," where she will also thank her supporters. Sen. Barack Obama and Clinton were in Washington on Wednesday to each address the influential American Israel Public Affairs Committee. The candidates ran into each other at the AIPAC conference and had a brief chat, Obama spokeswoman Linda Douglass said. "She's an extraordinary leader of the Democratic Party and has made history alongside me over the last 16 months. I'm very proud to have competed against her," Obama told the Israel lobbying group. Obama became his party's presumptive nominee Tuesday and will be looking to unite Democrats divided by the long and contentious primary season. "I am very confident how unified the Democratic Party is going to be to win in November," he said in a Senate hallway Wednesday. iReport.com: Obama/Clinton -- dream team or nightmare? Some say that putting Clinton on the ticket might fit the bill for uniting Democrats. 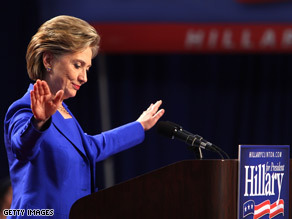 What's next for Sen. Hillary Clinton? AC360° investigates. Prominent Clinton backer Rep. Charles Rangel, D-New York, thinks the New York senator could have been "far more generous" during her speech Tuesday night after it was clear that Obama had clinched the Democratic nomination. Rangel, the senior member of the New York congressional delegation and an early supporter of Clinton's presidential campaign, said Wednesday that Clinton should have been more clear about what her plans are. "I would agree that after the math was in before her speech, that she could have been far more generous in terms of being more specific and saying that she wants a Democratic victory," Rangel said on MSNBC. iReport.com: Can you see Clinton as VP? Who could join Obama on the ticket? "I don't see what they're talking about in prolonging this," Rangel added. "There's nothing to prolong if you're not going to take the fight to the convention floor. ... I don't know why she could not have been more open in terms of doing up front what she intends to do later." She again invoked the popular vote, saying she snared "more votes than any primary candidate in history," but primaries come down to delegates, and according to CNN calculations, Obama has her beaten, 2,156 to 1,923. Even the White House seemed convinced of Obama's victory. White House press secretary Dana Perino said Wednesday that President Bush congratulated Obama on becoming the first black nominee from a major party. She said his win shows that the United States "has come a long way." The party's best interests were high on the minds of party leaders Wednesday, as Sen. Harry Reid, House Speaker Nancy Pelosi, West Virginia Gov. Joe Manchin and DNC Chairman Howard Dean called on Democrats to focus on the general election. "To that end, we are urging all remaining uncommitted superdelegates to make their decisions known by Friday of this week so that our party can stand united and begin our march toward reversing the eight years of failed Bush/McCain policies that have weakened our country," said a statement from the four. Billionaire businessman Bob Johnson, a close Clinton adviser and friend, said on CNN's "American Morning" on Wednesday that Obama could best forge party unity by offering Clinton the vice presidential slot. A day after the final two primaries in South Dakota and Montana, Johnson sent a letter to House Majority Whip James Clyburn to lobby the Congressional Black Caucus to endorse Clinton as Obama's running mate. "This is not a pressure. This is elected officials giving their best judgment," said Johnson, the founder of Black Entertainment Television. Johnson's letter to Clyburn says, "You know as well as I the deep affection that millions of African-Americans hold for both Senator Clinton and President Clinton." Johnson is one of many influential Clinton supporters who have raised the prospect of her joining Obama on the ticket. They say she has solid credentials and wide appeal, exemplified by her popular support in states such as Pennsylvania and Ohio, which will be crucial to a Democratic victory in the fall. Obama and Clinton spoke by phone for a few minutes Wednesday. He told her he wants to "sit down when it makes sense" for her, said Obama spokesman Robert Gibbs. Clinton said that would happen soon, Gibbs said, but he also said Obama did not raise the issue of the vice presidency. Clinton campaign Chairman Terry McAuliffe confirmed that there had been "absolutely zero discussions" on the matter. The Clinton campaign issued a statement saying she was open to becoming vice president. "She would do whatever she could to ensure that Democrats take the White House back and defeat John McCain," the statement said. CNN's Alexander Mooney and Ed Hornick contributed to this report.